So, I noticed that someone pointed out the Cats weren’t wearing their navy blue ‘home’ shorts in their first Home Final recently. But actually, they haven’t for years now. They hardly ever wear them anymore at all for some strange reason. Only twice this year for the whole season for example. Despite having 8 games in Geelong & other home games at the MCG & Etihad. Thankfully they will wear them this week though. Because there are only 2 teams in the entire competition the Cats ever wear their navy blue shorts against now. Even if they play in Geelong. Those 2 teams are Sydney & Gold Coast only. And the only reason they wear them against those 2 teams is thanks to an email I wrote to Brian Cook many, many years back now when the Cats wore white shorts against the Swans in Sydney. As they seemed to be the only team with a dark color in their team strip that ever did. For example, other Victorian based teams back at that time like Richmond, Collingwood, Essendon, St Kilda, Carlton & Melbourne all wore their home colored, darker shorts in Sydney. So why not the Cats? Thankfully Brian Cook rectified this. And now, as a result, they get to wear them against the Swans & now Gold Coast everywhere they play. Geelong don’t even get to wear their blue shorts against North Melbourne when they play at Geelong anymore & haven’t for years now either. This I simply don’t understand at all. But whoever makes these decisions has no idea some weeks in some games, as this clashing color, or home team color concept is all over the place in some games. For example, why does Essendon launch an all red clash jumper this year, but still wear their normal one as the away team against teams like Carlton & Collingwood when it clashes horribly. And why does Geelong have a clash jumper at all, as they didn’t wear it on one single occasion all year this year. Because if they don’t wear it at least against either North Melbourne, or Collingwood, then when will it ever be justified. And how does Collingwood get away with wearing a jumper with a black back & white numbers against teams like Carlton & Richmond & Essendon when they wear jumpers with black backs too. The Crows & the Power both wear their home jumpers in their local derby & they clash horribly as well, when they actually have far better options available. As the Eagles v Dockers, or Lions v Suns don’t have that same issue, so why the inconsistency again. I would be happy to offer my services free of charge to the AFL to actually get this right for them consistently & avoid this colorful mess. As it seems bleeding obvious to me before teams run out each week who should wear what, yet it’s amazing how ridiculously wrong it gets in some instances. Surely this is not that hard, as the clearly visible solution is staring us all right in the face. The AFL jumper-clash decisions seem random at best. Not sure the Pies have anything to do with the general inconsistencies across the competition from week to week. All CFC has done is reject wearing a bastardised hodge podge that is almost indecipherable to which club it is supposed to represent (the Crows & Dees are prime cases in point). Like fellow stripey teams North and Hawthorn, Collingwood has a reverse out jumper as their clash strip. This predominately white guernsey is basically the pre-2000 kit and is complimented with white shorts. It appears quite a few times each year, commonly against the other teams with black/dark backs and white numbers. A couple times this has been stuffed up, and I don’t know why. I’d have thought the same solution would be applicable to the Cats, which would also keep the integrity of the blue & white hoops. As you say Gary, whoever manages this aspect of the game does a great job of making a simple thing seem very difficult. Notwithstanding the aspect of clubs wanting to maximise merchandising revenue plays a part as well. There were only two colours for shorts, black for the home team and white for the visitors. Then along came televised games and the poor sods could not tell the difference between black shorts and wnite shorts. I still go by the shorts on tv. Makes life easier. The away strips are an abomination! Apart from the Swans, there is very little white on our wonderful guernseys. No wonder away teams lose. Can’t be too much pride in those Premier League footy strips. Just a money spinner for the AF! And more silly expense for every club. Let’s go back to black shorts for home and white shorts for away and get rid if all rhose wishy washy away strips. The only exception may be Essendon’s grey one of the past few years. Hi Gary, consistency is the AFL’s biggest issue on all fronts. White shorts at home was introduced to avoid the situation whereby a team with white as their main jumper wouldn’t create a mishmash of colours against the opposition. The best example of this would be a North Melbourne v Western Bulldogs match, with North wearing their predominantly white top with royal blue shorts, and the Dogs wearing a Royal Blue top with White shorts. It created a rather large mess of white and blue on the field and created a clash. 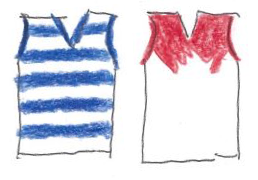 To increase contrast the AFL required both Geelong and North to wear white shorts with their white guernsey against dark coloured teams. This why Geelong are only permitted to wear navy shorts against Sydney, Gold Coast and Brisbane. You may have noticed this year North got sick of their white/white combo, so they decided to wear their royal blue away jumper in all home games, except against the Western Bulldogs. I agree with the AFL’s stance in the North v Dogs game and when Geelong play Collingwood, but I think it’s become overly strict for the most part. Geelong in their full home kit (White with navy shorts) are still going to be easily identifiable in every other match up this year. It is farcical that the AFL have no issue whatsoever with teams running out in the same colour jumper, but are obsessed with teams wearing different coloured shorts. I would ensure every away team must wear a jumper that doesn’t match the home team, and also permit Geelong and North, as the only two teams left with predominately white home jumpers, to wear their home shorts against all opponents except the Dogs in North’s case and the Pies/Blues for Geelong. Not many sports leagues have rules that apply to only 40% of the competition.